The Ocean is the Dog. Atmospheric Temperature is the Tail. At the recent Chapman Conference in Granby, Colorado, Skeptical Science’s John Cook advised the audience of scientists, communicators, and scientist-communicators, that the best way to fight “sticky” climate denial memes, is with memes of our own that are even stickier. Here’s one. Big props for Greg Laden on this, which I plan to integrate in future presentations. Encourage any and all to check out his blog. If you want to know exactly where your dog is, you could put at GPS sensor in the middle of it’s body, perhaps near the pancreas. It would give you an average position for your dog, and would be most accurate most of the time. If you put the GPS sensor on the tip of the dog’s tail, and used that to estimate where your dog is, you would be nearly wrong much of the time, even if over the long term this would be a good estimate for where your dog has been. More importantly, if you wanted to measure the movement of your dog, the GPS sensor in the middle of the dog’s body would tell you pretty accurately if the dog is moving or still. 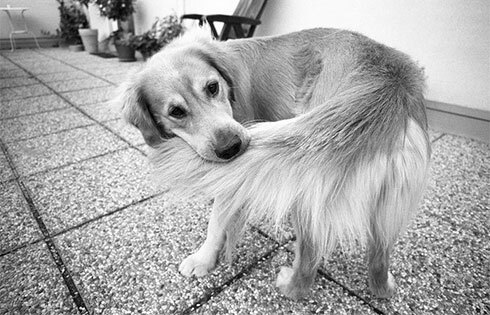 But a GPS sensor on the tip of the dog’s tail would often indicate movement when the dog is, essentially still (but wagging its tail). Latest piece for the Yale Forum on Climate Change and the Media. Last month I covered the emerging science linking arctic ice loss to changes in the jetstream, and the new normal “Weather Whiplash” we are seeing in the Northern Hemisphere the last several years. Although nearly all climate scientists are in agreement on the general outlines of climate change and greenhouse gas effects, there are still, and will continue to be, areas of the science that are not yet “pound on the table we’re done” as Richard Alley likes to say. Dr. Jennifer Francis of Rutgers has been making a persuasive case for the last year that polar amplification, and the loss of arctic ice and snow cover, are starting to have dramatic effects on global weather through the jet stream. See that video below if you have not already. Not everyone is in complete agreement. Dr. Kevin Trenberth is a highly respected senior researcher at the US National Center for Atmospheric Research in Colorado. He reasons that because heat flows are so much greater in the tropics, that we should continue to look there for answers to the puzzle. I talked to both experts last month, and boiled down the discussion here. I’ll be posting the complete interviews at a later time for serious wonks, but maybe not till I get back from Greenland. See the first “Whiplash” video below. Ok, let me apologize for the sound of my questions – I’m getting a second lavalier so that won’t happen again. That plus altitude induced hoarseness. I was interviewing Richard Alley at a conference in Colorado last week. This is part of what he said. More later. Repost: 2012, the Year Climate Change Got Real. Reposting. I liked this last night better than when I first made it. You probably wouldn’t be lurking here if you didn’t think this was cool. Volcanism at Mexico’s Popocatépetl is highly punctuated, especially during its current level of activity where domes of lava grow in the summit crater. These domes occasionally collapse or are destroyed by explosions that can lessen the pressure on the magma beneath to create an even larger explosion. This is akin to popping the top off a shaken bottle of soda — the dissolved bubbles come out of solution rapidly as the pressure is released and you get an explosion of soda. Today, Popocatépetl had one of those explosions, and thanks to the beautiful weather in Mexico and some nice placement of webcams surrounding the volcano, the explosion was caught on some pretty amazing webcam footage compiled by webcamsdemexico (see above). The video is short, only 30 second long, but after the first few seconds of calm, the explosion occurs, sending a dark grey plume into the atmosphere above the volcano. Now, these explosions come with a lot of force, and you can see after the initial explosion is how the clouds of water vapor around Popocatepetl shudder as the explosion front moves past. Then quickly, the upper flanks of the volcano turn grey from the rapid raining out of ash and volcanic debris (tephra). It is a little surprising how little the clouds actually care that the explosion just occurred at first, but as the explosion continues in this sped up video, the clouds do begin to show more disruption from the hot ash and volcanic gases being released during the explosion. You can also notice how the plume reaches neutral buoyancy not too far above the volcano (bigger the explosion, the higher it can reach before this happens) as the plume begins to spread laterally (to the right in this video) into that classic shape. My guess is the plume was a few kilometers tall by the time the video ends. You can see how pulsatory the eruption is as well, with the dark plume churning like steam from a steam engine. This might be due to new magma rising in the conduit, feeding the eruption as it continues. However, even with all this fury, the volcano went back to looking idyllic with only some minor puffs of ash within two hours after the explosion (see below) and only the grey ash on the slopes to show for the seemingly giant explosion. Even as impressive as that explosion seems, these ash and tephra deposits usually are wiped clean out of much of the geologic record by rains as they are only a few centimeters thick near the volcano and millimeters thick further away. Windbaggers, my name for the fossil fueled fake “grassroots”, tea-party inspired, anti-science activists who oppose renewable energy development, like to talk about the “threat” posed to birds by wind energy. The first lie you have to believe is that the Koch Brothers and their allies give a damn about birds, or any other living creature. What science shows it that the greatest threat, not just to birds, but all species, is climate change. Between a quarter and a half of all birds, along with around a third of amphibians and a quarter of corals, are highly vulnerable to climate change. These findings have emerged from the most comprehensive assessment to date of the impact of global warming on life. Its results have led some researchers to warn of the need for unprecedented conservation efforts if we don’t cut our emissions. The new assessment of climate change risk was performed by scientists from the International Union for the Conservation of Nature (IUCN), the organisation that produces the Red List of Threatened Species. “When the Red List was invented, it was long before anyone worried about climate change,” says Wendy Foden of the IUCN in Cambridge, UK. From IPCC Fourth Assessment, 2007 – Figure 4.4. Compendium of projected risks due to critical climate change impacts on ecosystems for different levels of global mean annual temperature rise, ΔT, relative to pre-industrial climate (approach and event numbers as used in Table 4.1 and Appendix 4.1). It is important to note that these impacts do not take account of ancillary stresses on species due to over-harvesting, habitat destruction, landscape fragmentation, alien species invasions, fire regime change, pollution (such as nitrogen deposition), or for plants the potentially beneficial effects of rising atmospheric CO2. The red curve shows observed temperature anomalies for the period 1900-2005 (Brohan et al., 2006, see also Trenberth et al., 2007, Figure 3.6). The two grey curves provide examples of the possible future evolution of temperature against time (Meehl et al., 2007, Figure 10.4), providing examples of higher and lower trajectories for the future evolution of the expected value of ΔT. Shown are the simulated, multi-model mean responses to (i) the A2 emissions scenario and (ii) an extended B1 scenario, where radiative forcing beyond the year 2100 was kept constant to the 2100 value (all data from Meehl et al., 2007, Figure 10.4, see also Meehl et al., 2007, Section 10.7). Red List assessments of extinction risk do consider climate change, but in a limited way. The main tools used in these earlier assessments are species distribution models, says Foden. These map out the climate conditions where a species lives now, then estimate how that liveable area will alter as the climate changes. In many cases, species’ habitable ranges will move and shrink, putting them at risk. While fossil fuel interests continue to cling to 19th century technology in developed nations, the developing world increasingly is betting on the technologies of the 21st century. UXBRIDGE, Canada, Jun 13 2013 (IPS) – Emerging economies such as Mexico and India are shifting energy investments into renewable resources while industrialised countries hesitate, noted two new United Nations reports released Wednesday in Nairobi, Kenya. “There is a structural change in the global energy sector underway,” said Ulf Moslener, head of research of the Frankfurt School in Germany. “Costs are dropping radically. Renewables represented 6.5 percent of all electricity generated and reduced carbon emissions by 1 billion tonnes in 2012,” said Moslener, co-author of Global Trends in Renewable Energy Investment 2013, a report sponsored by the U.N. Environment Programme (UNEP). Developing countries are finding installing green energy to be far less expensive than relying on fossil fuels, Moslener told IPS. Poorer countries want to reap the benefits of stable energy costs, new jobs, improved air quality and reduced health and climate damage. While political debates about the future of green energy preoccupy countries such as the United States, United Kingdom and Germany, developing countries have embraced cleaner energy. The move is reflected by a narrowing investment gap. In 2012, developing countries invested 112 billion dollars in clean energy, compared to developed economies’ 132 billion dollars. Investors understand that clean energy no longer costs more than fossil energy. As such, there is a lot of excitement about the potential of large-scale projects in wide range of countries.